Dos - Windows - Linux - Unix - Shell Prg. Description of "InsideThe Operating System (eBook)"
The author is a man of few words. Dr. Suhas Rokde (MCM, Ph.D) has a wide experience in IT. He play a role as Operator to MD in IT Companies. He is a founder and CEO of Astrotech Lab, He is now engaged in research over Modern and Spiritual Science and Tech. He published many journals for the same. He wrote 4 books in IT and other titles are waiting to publish with well publisher. 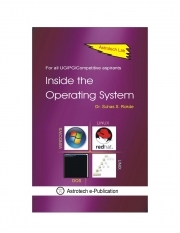 Reviews of "InsideThe Operating System (eBook)"